According to the APEM Journal, the problem begins when each part of the supply chain holds safety stock to buffer against variation in demand and the uncertainty of supply plus delivery. And it isn’t just with the end user, each stage of the chain—in effect, holds its own level of safety inventory all the way down the line. In this way, a few percentage points of change in demand at the end of the chain can balloon into double or triple digits by the time it gets to the supply side. This excess is an expensive drain on resources from space rental to security to even loss. Today, the bullwhip is moving faster than ever before. An important way to reduce the impact of the bullwhip effect is to remove as much guesswork as possible that leads to the hoarding of safety stock. 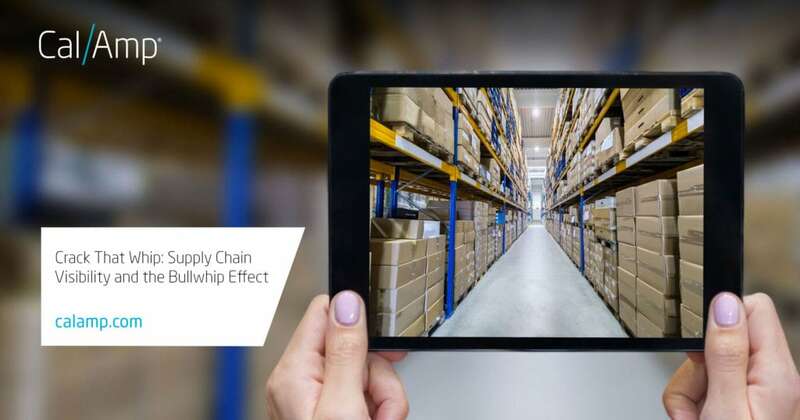 This requires complete, real-time visibility into the location of every order and shipment throughout the supply chain, even when it’s handled by a third-party logistics (3PL) company or a last-mile carrier. This is especially true in the case of smaller less-than-truckload (LTL) shipments, where tracking a trailer or container does not provide enough granularity to guarantee the location of the shipment itself. A full stack solution of sensors and software or even managed monitoring services, such as CalAmp Supply Chain Integrity (SCI), help add needed visibility to the supply chain. Today’s small, fast shipments require a nimble end-to-end technological solution to provide up-to-date insight that integrates with existing electronic data interchange (EDI) systems. This digital communication will drive better forecasting and reduce both delays and costs. For more information about supply chain visibility and what to look for in a solution provider, download our whitepaper here.